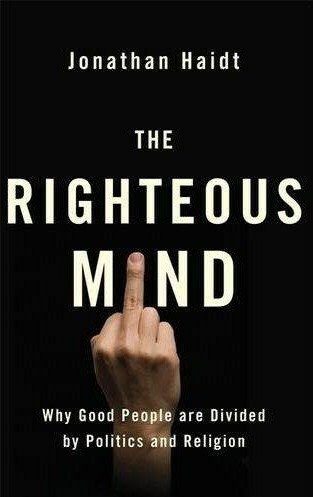 The Righteous Mind: Why Good People Are Divided by Politics and Religion. Jonathan Haidt. Pantheon, 2012. 448 pages. This book, the product of a powerful mind, integrates cutting-edge research from the disciplines of biology, psychology, anthropology, history, philosophy, and other fields. It attempts to answer a deceptively simple question: How do people determine what is right, and how are we to understand the differences between them? Haidt's answer is that morality is largely a function of processes autonomous of conscious thought. To use a metaphor in a book chock full of mnemonic devices, our minds are like elephants on which reason is the rider -- but that the rider serves the elephant, not the other way around. And that we cannot really begin to have a meaningful political discourse until we recognize that the basis of our disagreements are never really about formal logic. Haidt's assertion that explicit arguments are literally rationalizations for our deepest instincts has become something of a truism in recent neurological research (and a foundation of his last book, The Happiness Hypothesis). But this observation is merely the point of departure in The Righteous Mind. It turns out that Haidt's real agenda is to deconstruct the liberal secular disposition that he's clearly calculating is the default setting for readers of his work. This deconstruction involves pointing out the striking degree of parochialism on the part of those who consider themselves enlightened. He notes that most of the people who design social science assessments, along with the volunteers who participate in them, are WEIRD -- Western, Educated, Industrialized, Rich, and Democratic -- and that such people are in fact a tiny minority of the global population. Gaining critical distance on this subset, which he acquired by spending time in India, has helped him to understand the world beyond the elite institutions (Penn, Chicago, the University of Virginia) where he has done most of his work. From there, Haidt goes on to posit that morality consists of a series of discrete sensors akin to the way those on our tongues determine our sense of taste. They are spectra of care/harm; liberty/oppression; fairness/cheating; loyalty/betrayal; authority/subversion; and sanctity/degradation. Liberals, he notes, have a very high degree of sensitivity to care criteria, along with aversion to oppression and and an emphasis on fairness (typically defined in terms of equality). Conservatives, by contrast, are not devoid of such sensors; they too wish to avoid harm, oppression and unfairness, though they tend to cast averting such evils in terms of freedom from rather than freedom to, and to define fairness in terms of proportionality rather than equality. Why does this matter? It matters, he says, because biology says it does. Haidt slices through the age-old Gordian knot of nature vs. nurture by jumping on the au courant bandwagon that our brains are not hard-wired, but rather pre-wired. Biology is not destiny, exactly: any number of programs can be downloaded, depending on environmental availability. But not an infinite number. And all of us come equipped with outlets for inputs like a sense of the sacred, whether or not they get filled. Haidt is less interested in whether God actually exists than what he regards as a powerful predilection to behave as if there is one (or 600). He makes a kind of neurological Pascal's Wager: we're better off believing. And this matters, in turn, because one of the things human beings most certainly are is social beings. Haidt regards the concept of rational self-interest as misleading, not so much because there isn't such a thing, or because that he wants to affirm the reality of altruism, but because humans, liberal mythology notwithstanding, are not simply collections of individuals, but part of larger social organisms that belong to, and behave, in terms of a hive, at least some of the time. Insofar as there is such a thing as altruism, he casts it in terms of Darwinian group selection. Which is to say that altruism is real -- but inevitably circumscribed. We can act on behalf of causes larger than ourselves, but there are strict limits on how far that can go. We will die for God or country. We will not for socialized health care or an abstract sense of a global community. And those of us who really are passionate about such things have little hope of convincing our fellow citizens that such causes matter unless they're able to cast them broader moral terms than relying solely on caring or fairness. One is reminded here of the late Christopher Lasch, who in The True and Only Heaven: Progress and Its Critics (1991), anticipated many of these arguments. As Lasch reminded us in that book, it was the Reverend Martin Luther King who scored the greatest successes in the Civil Rights Movement, a movement that was most successful when its resources and aspirations were understood in terms of (evangelical) religion. The Righteous Mind is a very carefully constructed book; Haidt ends each chapter by summing up his main points as part of a larger strategy to construct as sturdy an empirical edifice as he possibly can. As his tower gets higher, one nevertheless becomes increasingly aware of its wobbliness: scientific findings -- especially social science findings -- are changing all the time; one generation's insight becomes the next generation's fallacy. And while few of us are in a position to credibly vet the methodology of what seem to be rather cleverly designed surveys, it seems impossible not to think that the wording of a question here or a protocol there wouldn't lead in another direction. What's really troubling, though, is how emphatically Haidt seems to stint the role of rational discourse in the making and changing of individual minds -- a bit odd, actually, given that this is a densely reasoned piece of writing. He mentions a few times that such discourse can matter in some situations, but he spends little time showing where and how. It's enough to make one think that there's another dissertation on the horizon by a graduate who takes this vague sense of unease and fashions it into a form of neo-rationalism for the post-Obama era. Surely someone will posit a compelling Darwinian story about how a capacity for persuasion is more than a mere appendix in the lottery of natural selection. Still, it's no mean praise to say The Righteous Mind is a book written in good faith. It deserves to be read and discussed widely. Jim Cullen writes book reviews for the History News Network, from where this article is adapted.